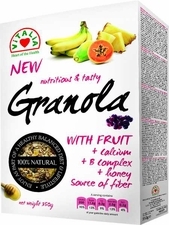 Granola is a breakfast food and snack food, popular in North America, consisting of rolled oats, nuts, honey, and sometimes puffed rice, that is usually baked until crisp. During the baking process the mixture is stirred to maintain a loose, breakfast cereal-type consistency. Dried fruits, such as raisins and dates, are sometimes added. Besides serving as food for breakfast and/or snacks, granola is also often eaten by those who are hiking, camping, or backpacking because it is lightweight, high in calories, and easy to store; these properties make it similar to trail mix and muesli. 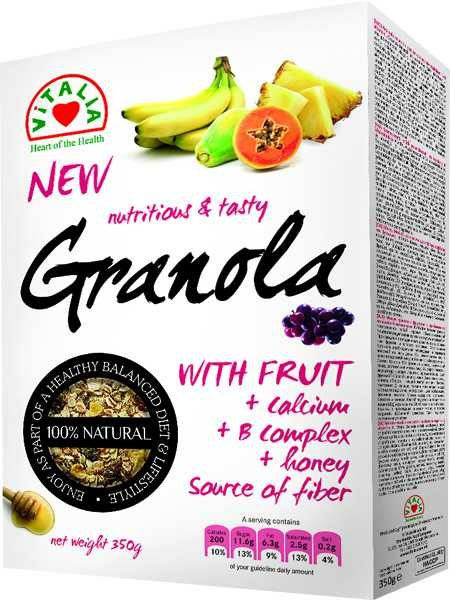 Granola is often eaten in combination with yogurt, honey, strawberries, bananas, milk, and/or other forms of cereal. It can also serve as a topping for various types of pastries and/or desserts.